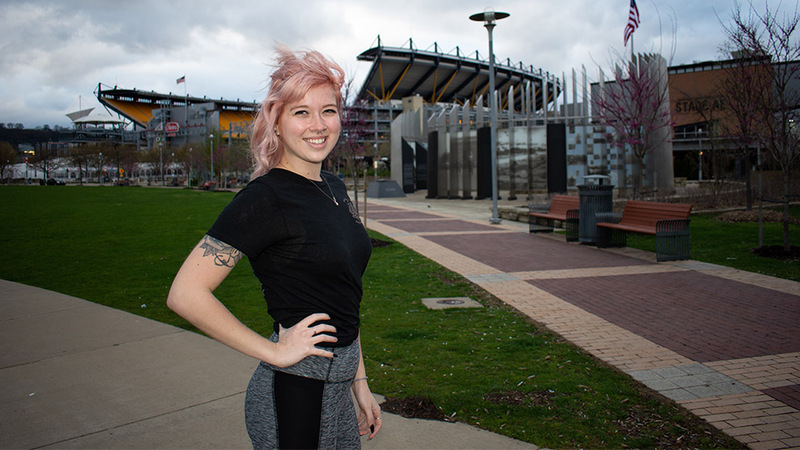 "The greatest opportunity I have had through Point Park is a job with Live Nation that I’m starting this summer. I got this position at Point Park’s Career Fair, which I was actually attending as an event photographer. With my strong resume and portfolio of work that I built through my internship, I was hired!" I chose Point Park because I was looking to transfer schools and find a major that better suited me and my interests. I looked at Point Park when I was a senior in high school, but thought I wanted to major in computer information systems at the time. Once I figured out that CIS was not my cup of tea, I looked into other majors. I saw that Point Park offered multimedia, and the courses and job opportunities sounded interesting and fun. I toured campus and Point Park seemed like a perfect fit. I decided to transfer, and man, was it a great decision. Tell us about your experience as a photography intern for Point Park. I can’t even begin to say how great my experience as a photography intern for Point Park University’s Enrollment Marketing Department has been! I began this position as a practicum student photographer and loved it so much that I’m continuing on. Amanda Dabbs is one of the greatest supervisors. She is extremely nice, helpful, caring and highly professional. Gina Puppo and Felicia McKinney are such great ladies to work for as well! In this internship, I learn more from each assignment. Not only am I adding to my skill set as a photographer, I am practicing interpersonal communication skills and professionalism with each client I meet and event that I work. I love meeting people from all walks of life, and making sure we get a photo that they will be proud to see published. What opportunities have you had to expand your photography? Being able to photograph different people and events has opened up many opportunities for me. I discovered a new interest in concert photography from my first concert assignment covering Super American and Chase and the Barons at the Pittsburgh Playhouse. I’ve also had the opportunity to take photos at The Club at Stage AE twice, which was very exciting. In addition, I have photographed performances at the Point Park University iHeartMedia Stage, and got to meet Noah Cyrus there! The greatest opportunity I have had through Point Park is a job with Live Nation that I’m starting this summer. I will be doing photography and assisting with other aspects of the Premium Seats VIP Services. I got this position at Point Park’s Career Fair, which I was actually attending as an event photographer. I started a conversation with representatives from KeyBank Pavilion / Live Nation and got an interview from there. With my strong resume and portfolio of work that I built through my internship, I was hired! Do you have a favorite concert that you’ve photographed? All of the concerts I have been able to shoot are unique, making it hard to choose a favorite. I really loved my first show, Super American at the Playhouse, because the lighting was fantastic to edit and the photo angles were super cool. However, I recently photographed Pioneer Records artist Gabe Reed’s CD and Music Video Release Party at Stage AE, and loved having a media pass to get next to the stage and above for some different shots. The performers were very good and there was great energy. It was also cool to see the music video that Point Park students produced for Gabe. Every concert is something new, challenging and exciting! Where is the best study spot on campus? My favorite study spot is on the second floor of Lawrence Hall. The comfy couches really win me over. This is where I can just kick up my feet, pull out my laptop, put my headphones in and get to work. My biggest advice to incoming students is to get involved with something that can open you up to new opportunities, and network like crazy! Practicums are an excellent start and can help give you some direction. Don’t be afraid if you don’t know exactly what you want to do in the future. Always try your hardest, go with the flow and see what happens when you put your mind to something. Don’t be afraid to take that jump. And did I mention networking?! Don’t burn bridges, but rather build them, as you never know who could help you down the road.